Head Position when Swimming. Further thoughts. Head position is key to either helping or hindering your full stroke FC. Too high and like a ‘see saw’ the legs will suffer leaving you swimming uphill as they sink. Imagine sticking your head out of a sunroof in a car, you will ruin the aerodynamics of the car shape. Too low and and it is a long way up to get to the air! Some coaches associate head position with low legs solely, but poor kicking technique will also sink them. It is not a miracle fix. Legs need to be addressed as well. Looking at and facing the bottom of the pool is probably the most hydrodamic position for fast racing you can achieve but rarely practical for public lane swimming with peoples feet flailing in front. Openwater also has its own compromises where you need to sight forwards. I would suggest look forwards but not to the extent you are facing forwards which can strain the neck, make turning to breathe trickier and keep the body slightly uphill. Keep the head still unless turning to breathe. A central snorkel can help practice this by eliminating the need to turn for air. Breathe slightly backwards. The assumption will be to lift forwards and up for air but in fact a turn sideways/slightly backwards will create a shallow trough in the water bringing the air nearer. The two swimmers in the pic demo this nicely. Closest swimmer lower head but higher mouth. Furthest swimmer higher head, lower mouth. Eventually aim to submerge the lower goggle, not easy until the body in general sits higher in the water. Note the pic again. After inhaling try to get the head back into its neutral position before the recovering arm returns to the water. Timing the breath – Follow the hand under the body as it pulls you forward, turn sideways into the breath as the hand passes under the body. Aim for a slow trickle exhale under the water and a fast inhalation when you have access to the air. Some of the following might be of interest. I wrote for Speedo on the topic of head position in openwater. becky horsbrugh on Swim of the Year. 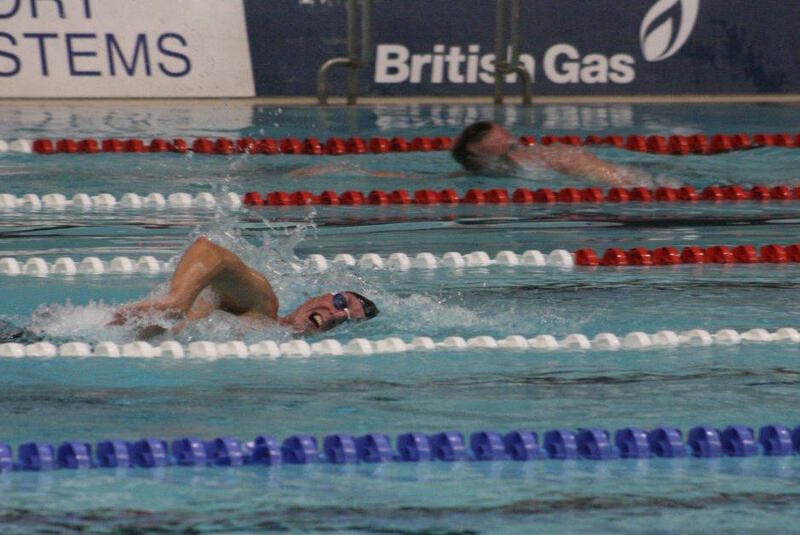 Dan Bullock on Swim of The Month…. Michelle Robinson on Swim of The Month…. Mary Armitage on Swim of The Month…. Jan Harvey on Swim of The Month…. You can read our full Terms & Conditions here You can view our GDPR-compliancy policy here.